This elegant townhouse has just been renovated and furnished to provide the ultimate in contemporary self-catering accommodation with sea views, a patio garden. 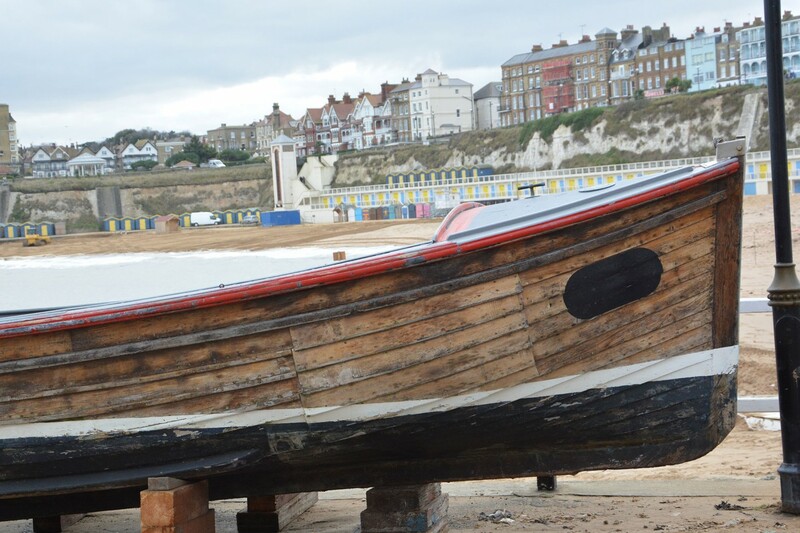 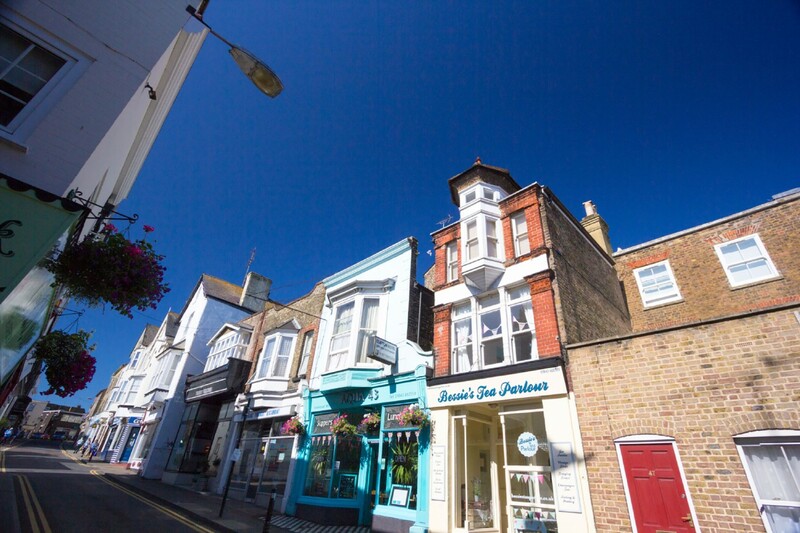 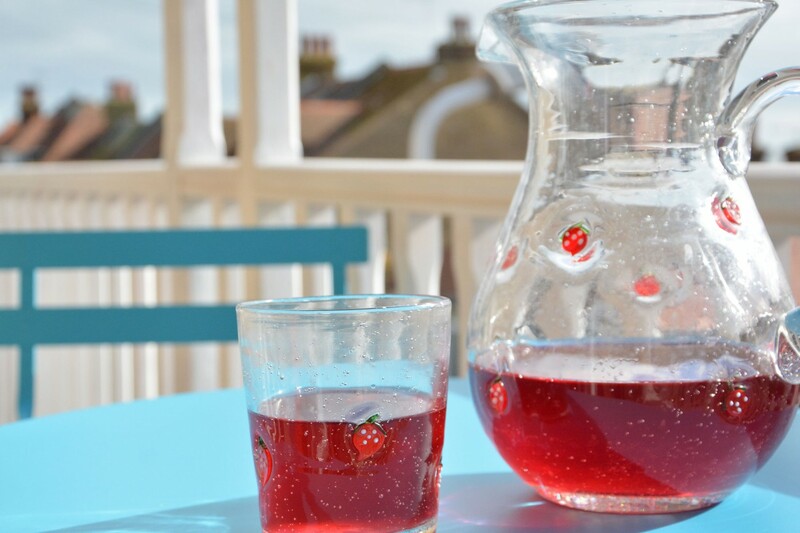 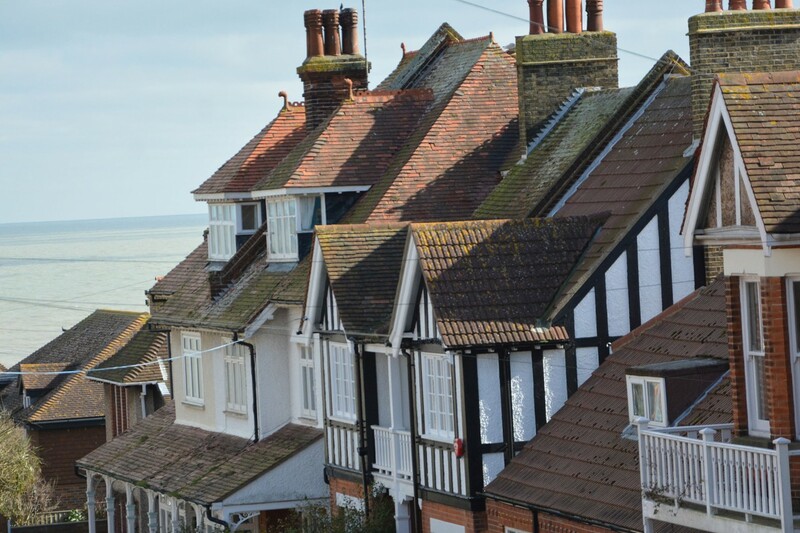 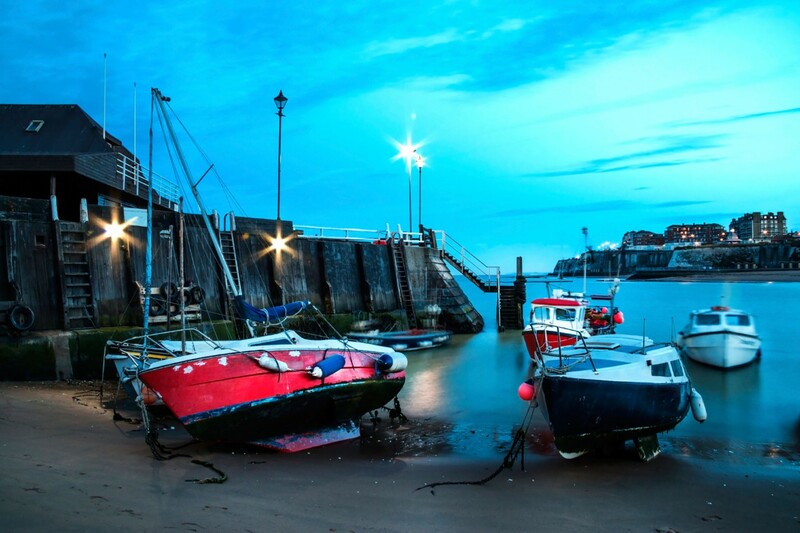 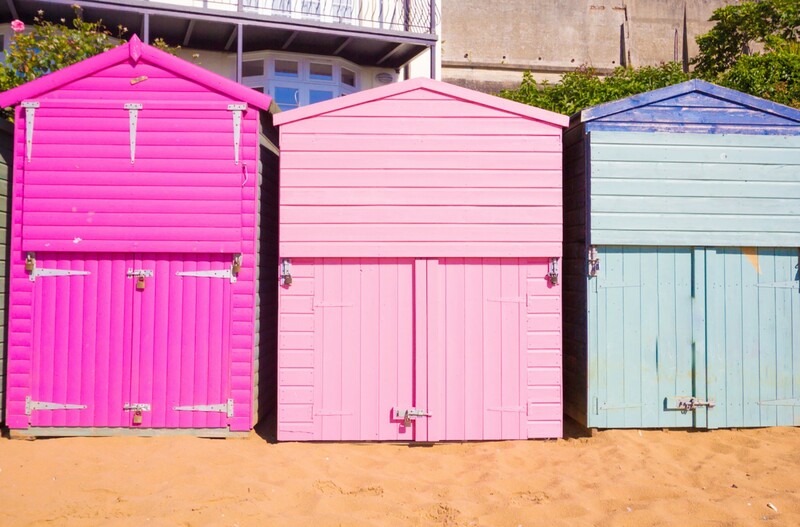 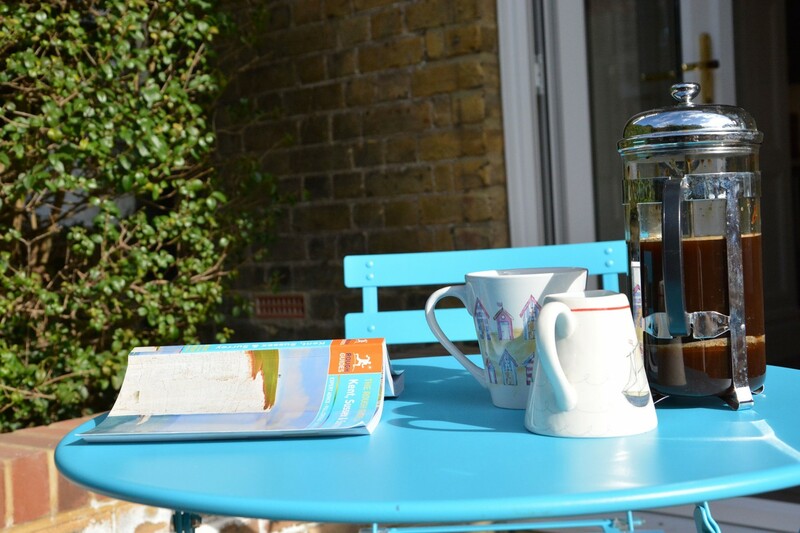 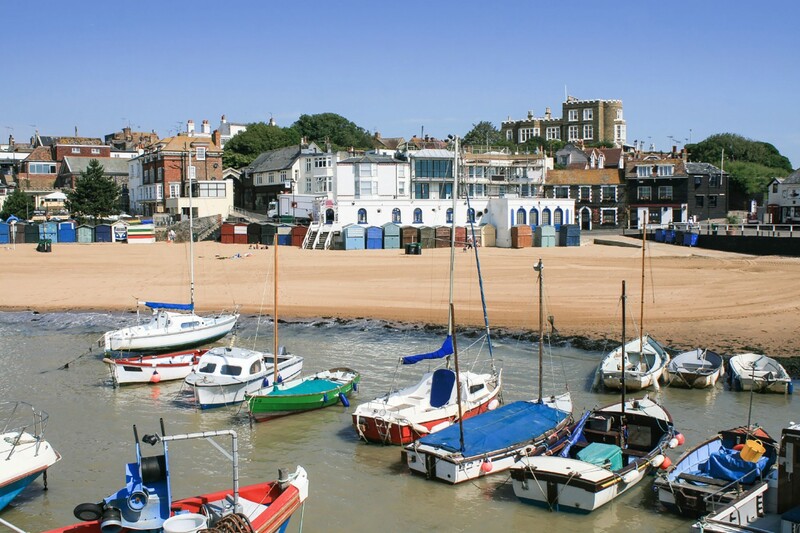 Broadstairs has been described as “A secret foodie heaven on the Kent Coast” and Seashells is a brisk walk from the heart of town with excellent eateries and independent shops, and just a pebble’s throw from the blue-flag sandy beaches. 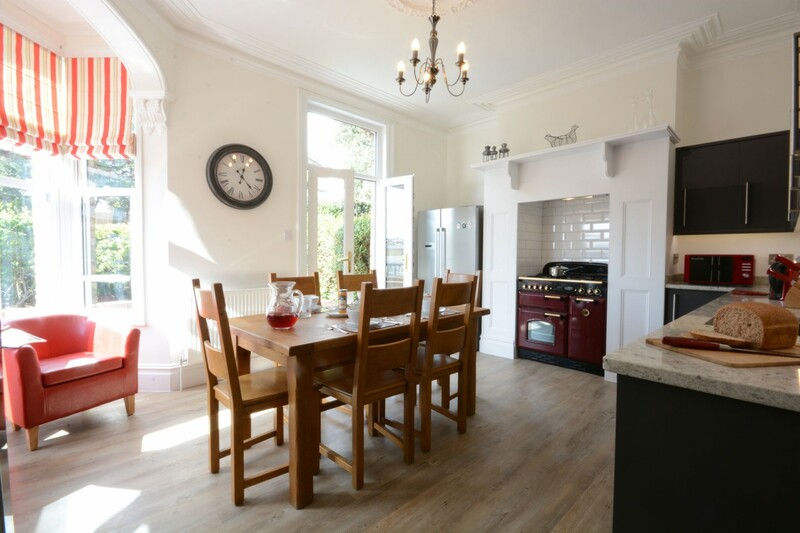 High ceilings, cornices, ceiling roses and feature fireplaces have been combined with stylish furnishings to create a homely feel from the moment you step into the hall. The modern and well-equipped kitchen/dining room is to your left with double doors opening to the patio and a shower room lies ahead of you. 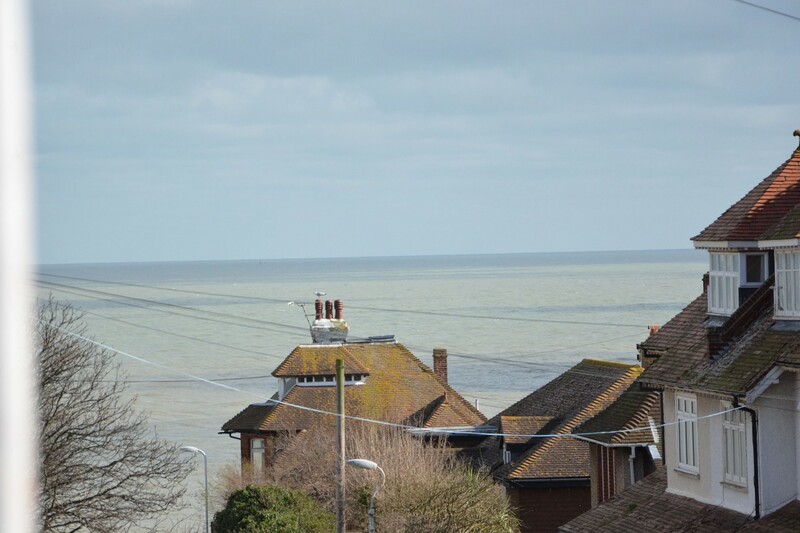 The first floor extends over the neighbouring apartment with a sunny west facing living room at the top of the stairs and the three bedrooms, all with sea views, well positioned for the luxury family bathroom. The first floor west-facing balcony invites you to look out to sea or watch the sun set and you can soak up the sea air in the private patio. There’s unrestricted on road parking if needed. 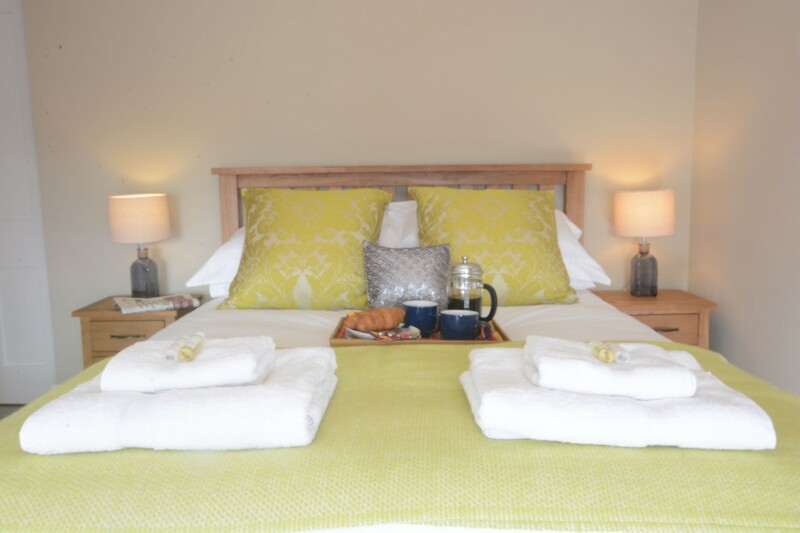 You’re welcomed into an impressive high ceilinged hall with stairs ahead of you and doors opening to the kitchen and shower room. 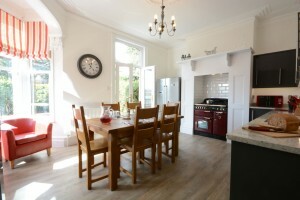 A spacious, modern and well-equipped kitchen with double doors opening to the sunny patio and a table with six chairs set in the big bay window; this is a great place to enjoy meals with family and friends at any time of the year. 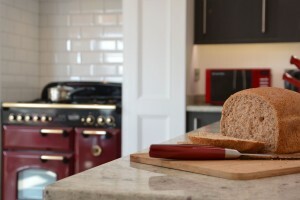 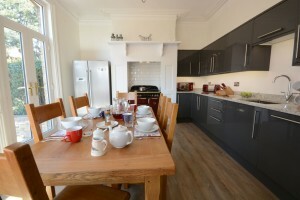 Stylish units with granite work surfaces run in an L shape at one side of the kitchen and equipment includes an American style Bosch fridge/freezer, Bosch dishwasher, freestanding microwave, a Rangemaster Classic with five gas rings including wok burner, one conventional oven and one fan oven with separate grill. 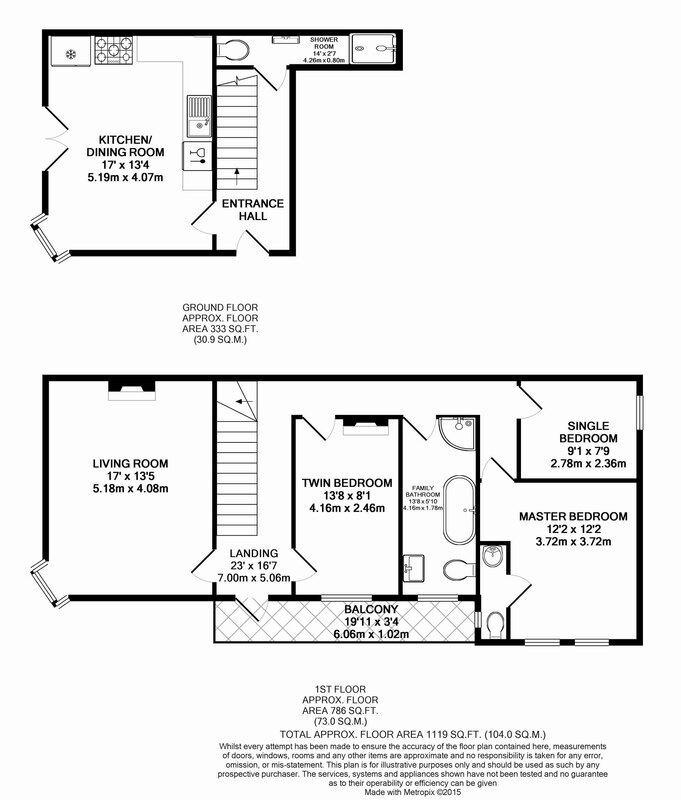 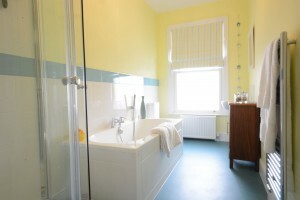 A modern room with large walk in shower at one end and wash basin, WC and heated towel rail at the other. 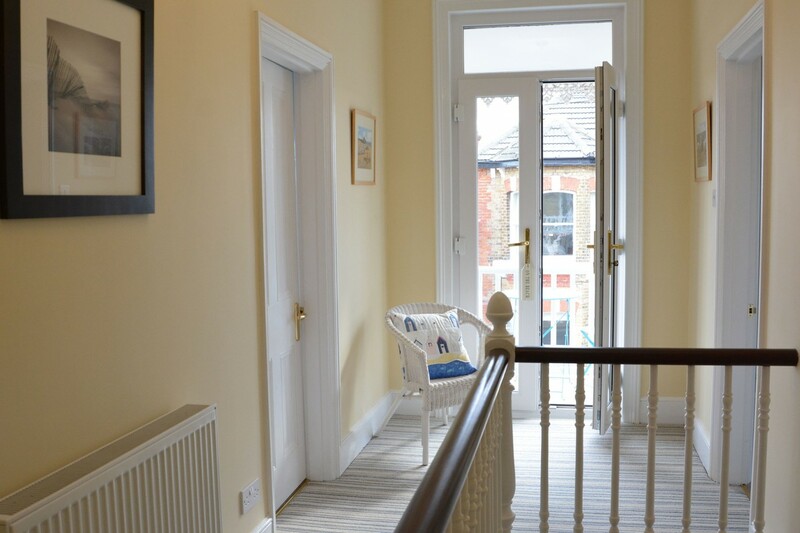 The staircase with the original ornate hand rail and banister runs from the hall to the first-floor landing which runs in an L shape with the living room and twin bedroom at one side and the master, single and bathroom opening off another corridor. 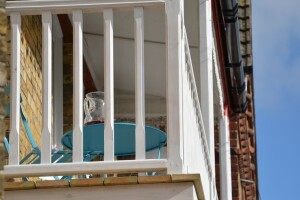 There are also double doors to the west facing balcony with bistro style table and a couple of chairs where you can sit and admire the sea view. 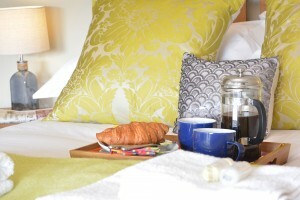 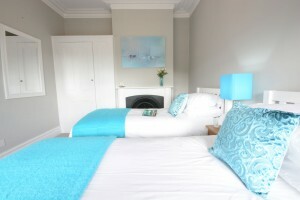 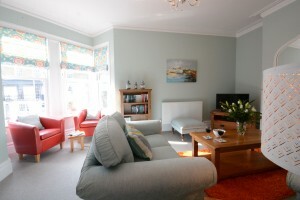 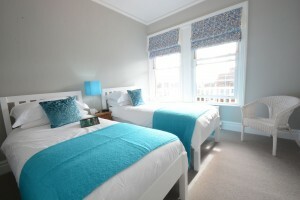 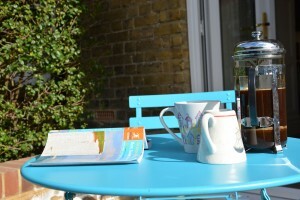 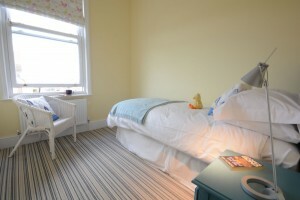 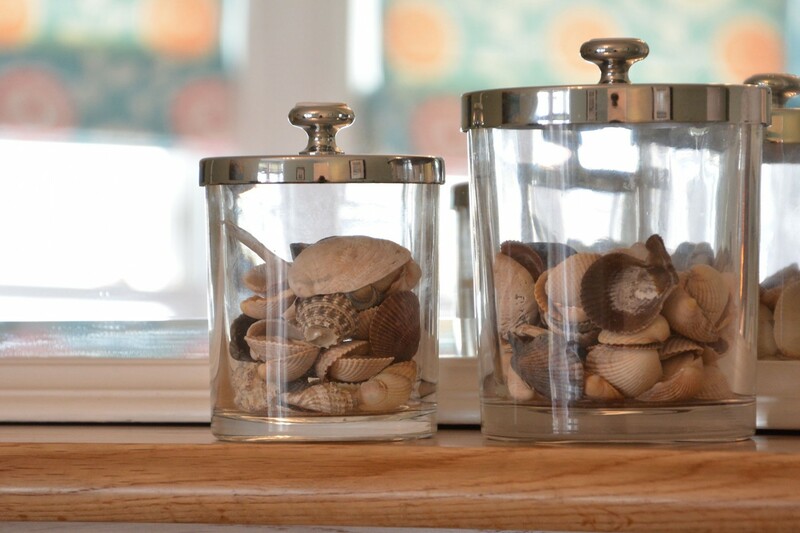 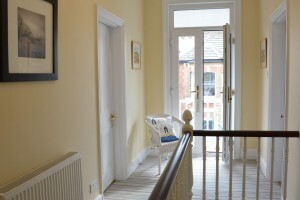 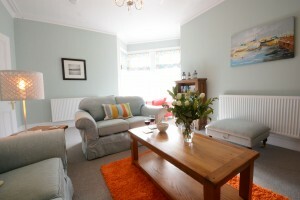 Enjoy the views of the sea and town from the large bay window, which catches the afternoon sun. This elegant room is comfortably furnished with sofas, chairs, occasional tables and has period features in the fireplace (non-working) and attractive coving detail on the high ceilings. Opposite the living room, this charming room with feature fireplace also has a view of the sea beyond the balcony and is furnished with twin beds, bedside drawers, a chair and has a there’s a built in wardrobe with shelf above. 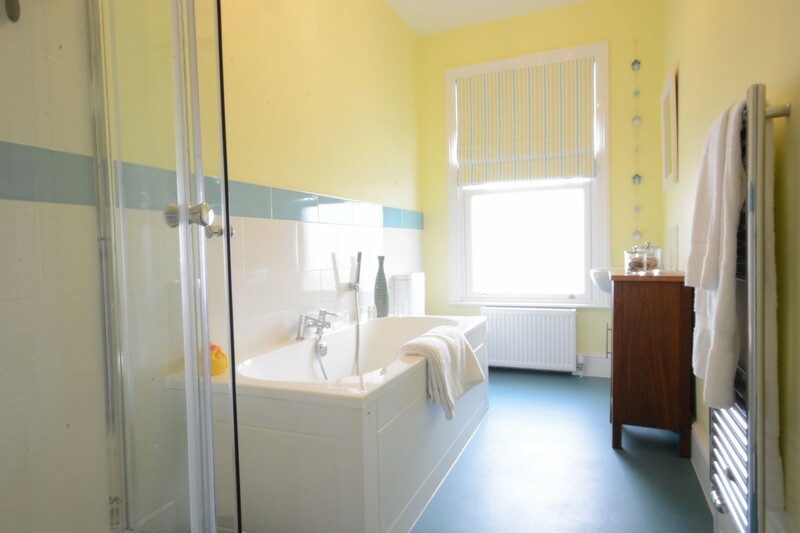 Along the corridor, so easily accessible from all three bedrooms, this large newly fitted modern bathroom has a bath with central taps, corner shower cubicle, wash basin, WC, heated towel rail and window allowing the light to stream in. 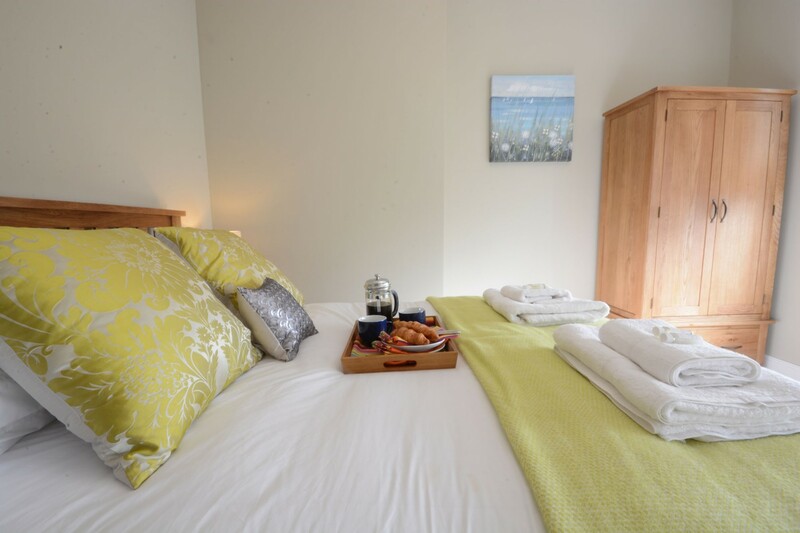 Stylishly furnished, you can watch the sun setting over the sea from this room which is furnished with a king size bed, bedside tables, a wardrobe and chair. There is a good view of the coastline from this bright room. The room can be set up as either: one single 2'6" bed with space for the travel cot to the side (please request at time of booking) or, set up for two children under 14years as two 2'6" single beds. 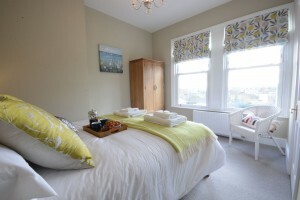 There is a two drawer bedside cabinet, a wicker chair and hooks for hanging clothes. 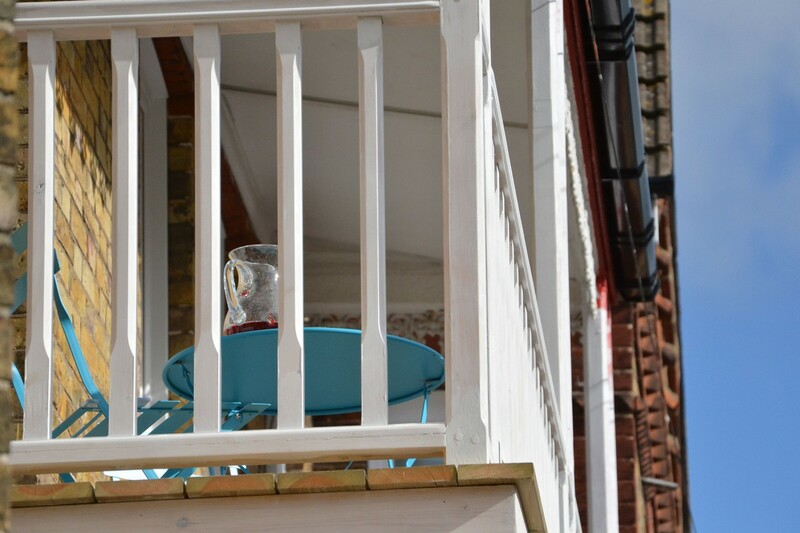 The first floor west facing balcony invites you to look out to sea or watch the sun set and you can soak up the sea air in the private patio off the kitchen where there’s a table and chairs for meals outside. 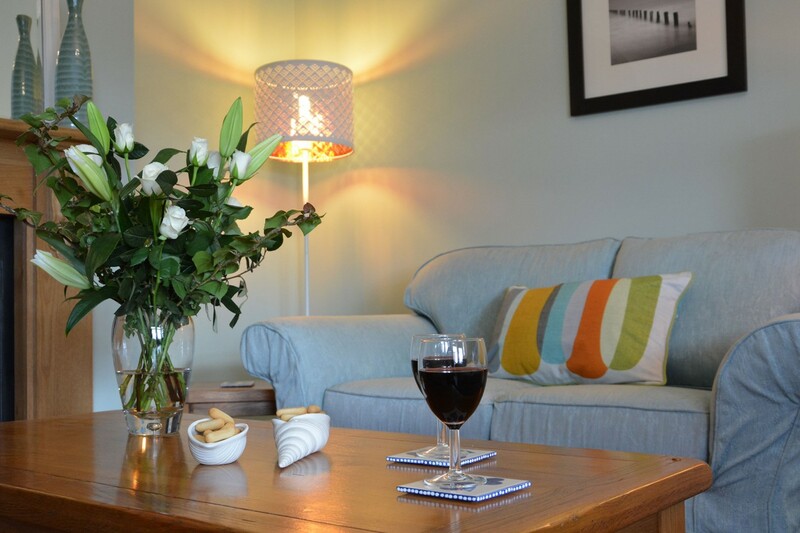 This semi-detached self-catering holiday cottage is equipped with gas central heating and appliances include a TV with Freeview, Wifi and iPod docking station. 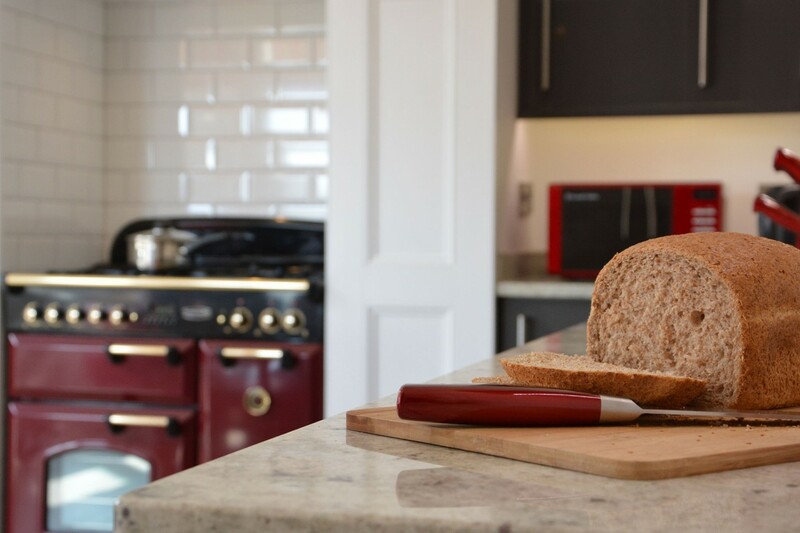 The kitchen is well equipped with American style Bosch fridge/freezer, Bosch dishwasher, freestanding microwave, a Rangemaster Classic with five gas rings including wok burner, one conventional oven and one fan oven with separate grill. 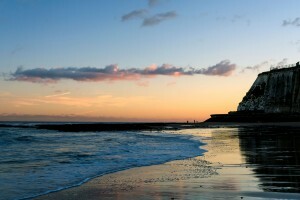 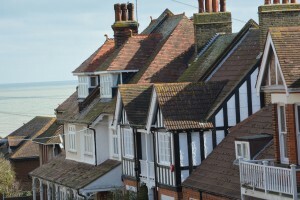 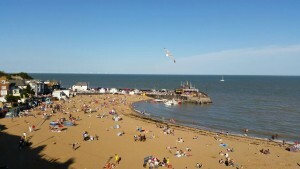 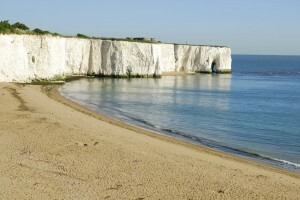 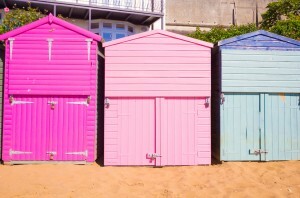 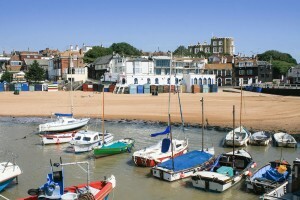 Broadstairs described as “A secret foodie heaven on the Kent coast”, is within easy reach of London – full of nostalgic old-world, seaside charm with blue flag sandy beaches and bays, surf schools, chic shops, retro ice-cream parlours, fishermen’s cottages and Charles Dickens connections. 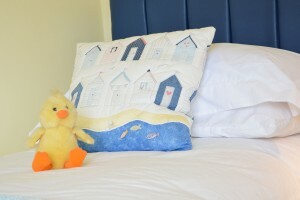 Seashells is perfectly positioned with views of the beautiful Stone Bay and just a short walk to the town’s main beach – Viking Bay, one of seven sand-filled beaches where you’ll discover children’s rides, beach huts, a harbour, cliff-top promenade, mini-golf and seaview bandstand where you can relax and unwind. 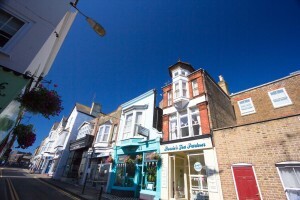 The town itself has a wealth of cafes, restaurants, bars and independent shops to enjoy with the High Street full of historic red-brick and flint-fronted buildings dotted between a rich stock of independent shops. 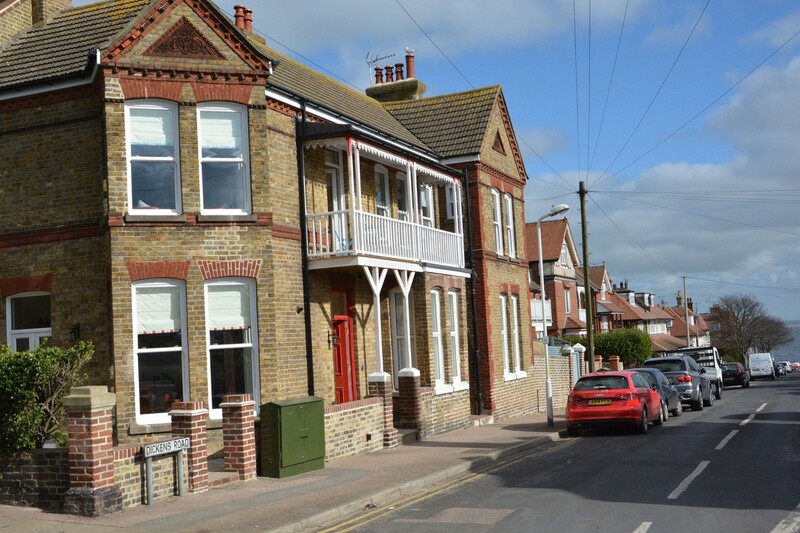 There’s even a gem of a cinema and live theatrical and musical performances in the community theatre. 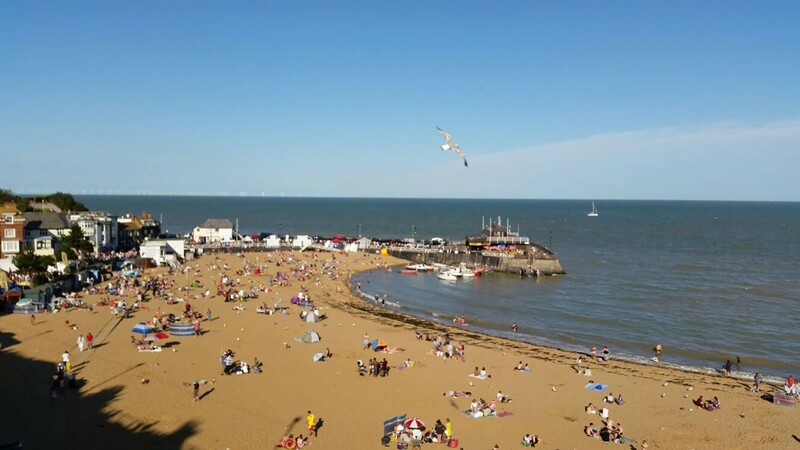 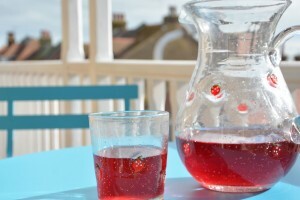 For food lovers, Dickens enthusiasts or festival goers it’s worth looking at the Broadstairs website for dates of the annual Dickens Week in June when the town’s abuzz with historic characters; the Folk Week in August or Food Festival in October.